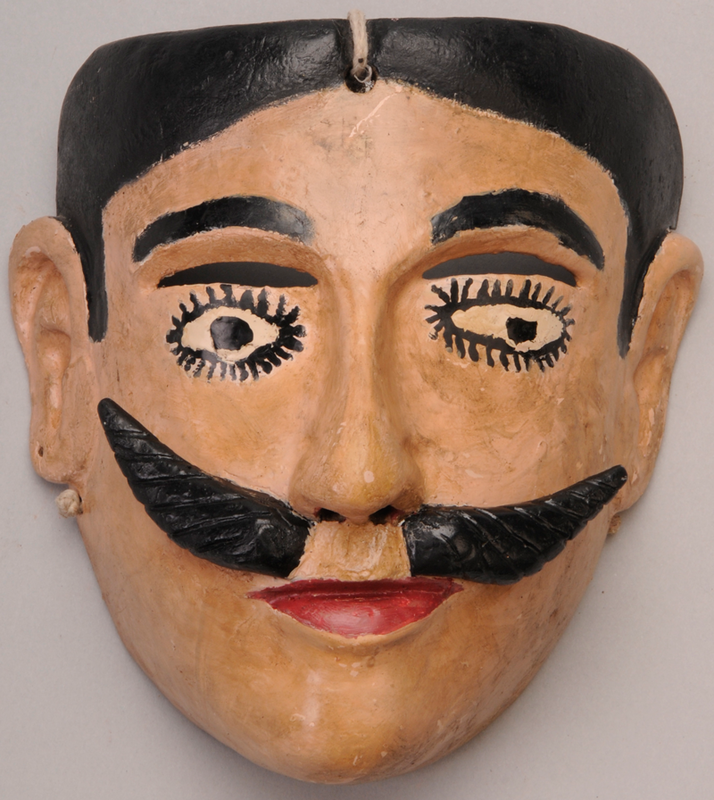 This is the EBay mask of a Tejonero (or Huehue), from La Danza de los Tejoneros (or Huehues). Unfortunately, the paint is worn away, but I want to call your attention to the carved features. Starting from the top, the hair is very carefully carved in relief, with grooves, as is the mustache. As is often the case for this carver, the designs for the brows and the nose are integrated; actually one sees this integration in the masks of many cultures, such as those of the Inuit and the Tarahumara. The eyes were painted but not carved in relief; this carver only occasionally carved the eyes in relief. Below the brows, and over the eyes, we find openings to permit the wearer to see; I call these vision slits. Look how carefully the vision slits are shaped and contoured on this mask. Note the curving planes over the vision slits that sweep down the sides of the nose. Finally, observe the jutting lower lip of the mouth, how it curls. Such details will be more apparent from the side view, as will also be the case for the ears. From the side, you may be able to see the bulbous nares at the base of the nose, the curling lower lip is more evident, and one is particularly aware of the careful carving of the planes above the vision slit. Of course the main reason that I am showing this view is to demonstrate this very sophisticated ear design, which is unlike any of the styles used by other carvers in this region. 1. 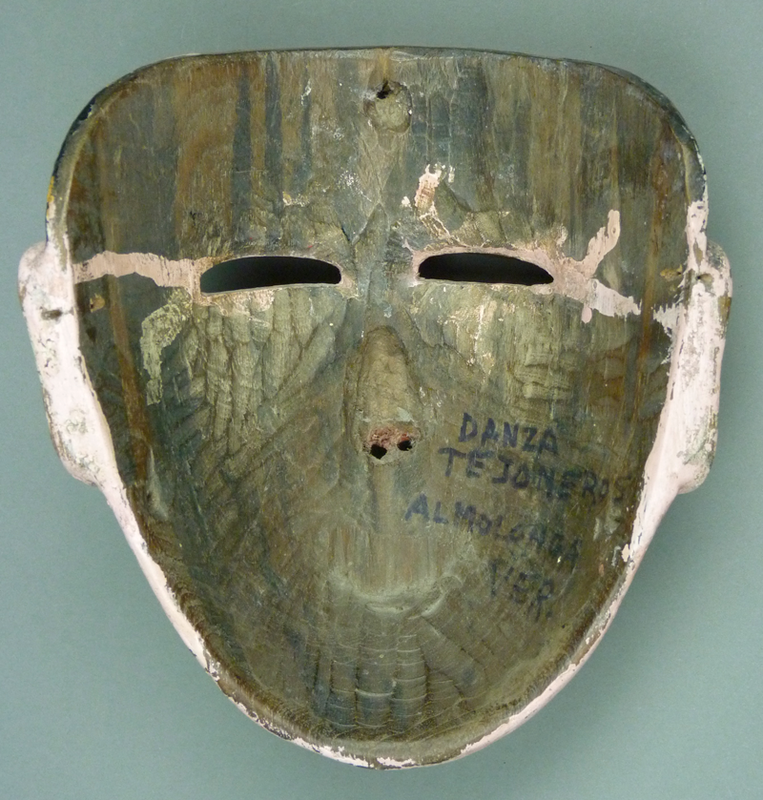 Patina or “wear”—When a dancer wears a wooden mask, his face makes close contact with the back in some areas, particularly along the rim of the mask, and less so on the flat back, which has been deliberately recessed to minimize or prevent such contact. After use for several hours, the points of contact become stained by the dancer’s sweat, which contains water, salt, and oils from the skin. Often the dancer will wipe the back with a cloth after use. Over repeated uses, the staining builds up, creating something that I call “sweat varnish.” Because of the variation in contact with the dancer’s skin, the back of the mask will demonstrate differential staining. 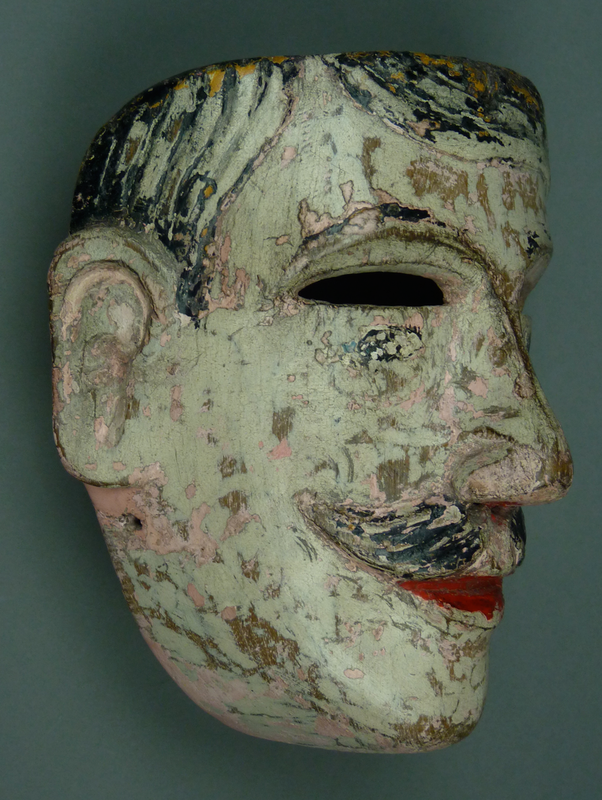 The presence of differential staining is one test for the authenticity of a danced mask. 2. The back of a mask often presents a stylized form that reflects a regional design. Then, within those parameters, the individual carver will add his own characteristic design details. Benito, for example, has a tendency to hollow out an area in front of the nose, and to bore holes there to aid the dancer’s access to air. He also carves a small flat spot, or “shelf”” that corresponds to the position of the dancer’s mouth. Less commonly he would sometimes create a hollow pocket to hold the knot of the top strap (usually a heavy cord). This last feature is rare for other carvers. 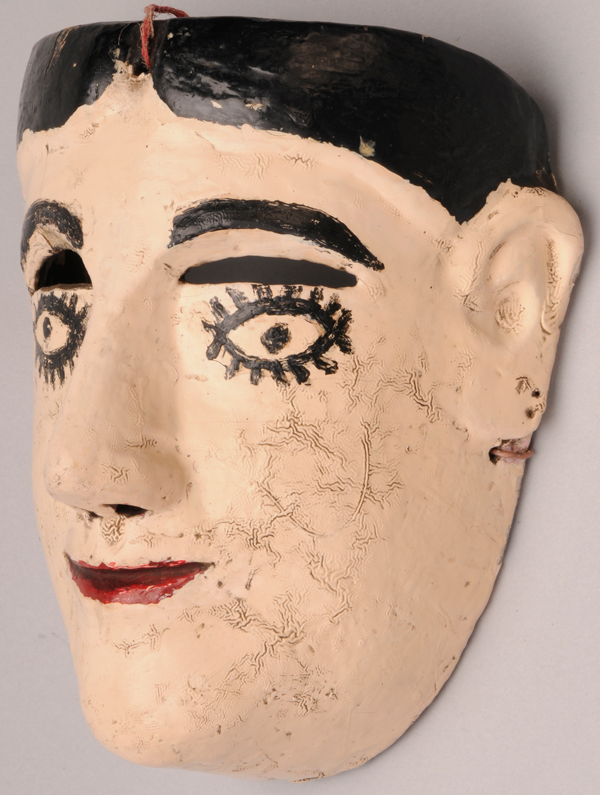 As it happened, this mask had not only the characteristic ear design for Benito, along with his characteristic sculpted brows and nose, but also three typical features on the back. 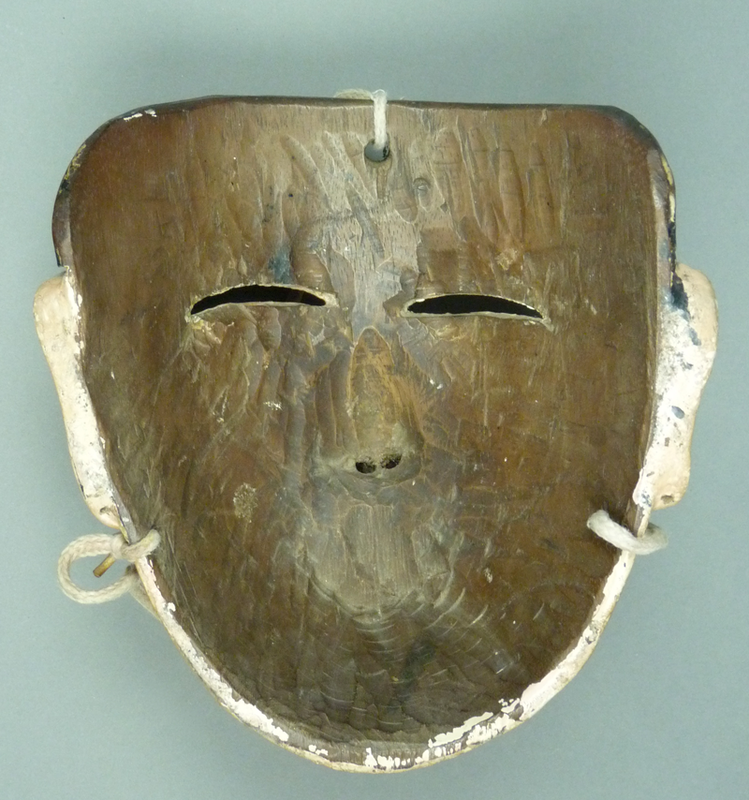 By knowing the features of this carver, I am able to make a very positive identification of this mask. 3. There can be an interaction between the patination or staining process that results from the dancer’s sweat with these special features. Note that the hollow for the nose protected the bridge of the dancer’s nose from contact with the wood, as did the hollow spot to accommodate the mouth, so both areas are more lightly stained. The hollow spot for the knot is also less stained. Examination of such details allows one to feel more confident that one is seeing authentic differential staining. That is, the mask market is flooded with masks that have been stained to create a false impression of age. Usually those masks lack differential staining; instead the entire back of the mask is stained uniformly, often to a very dark brown color, or even black. 4. It is not uncommon to find writing on the back of a mask. Usually one sees the dancer’s name, or maybe several names, as if the mask was loaned to one person and then another. 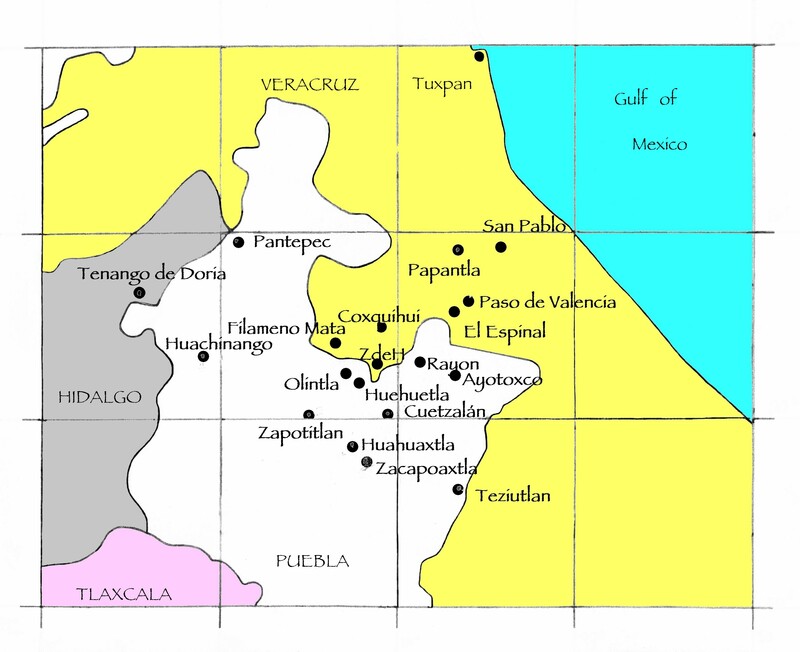 In this case the person who collected the mask wrote the name of the dance and the place where it was found—Almolonga, Veracruz. 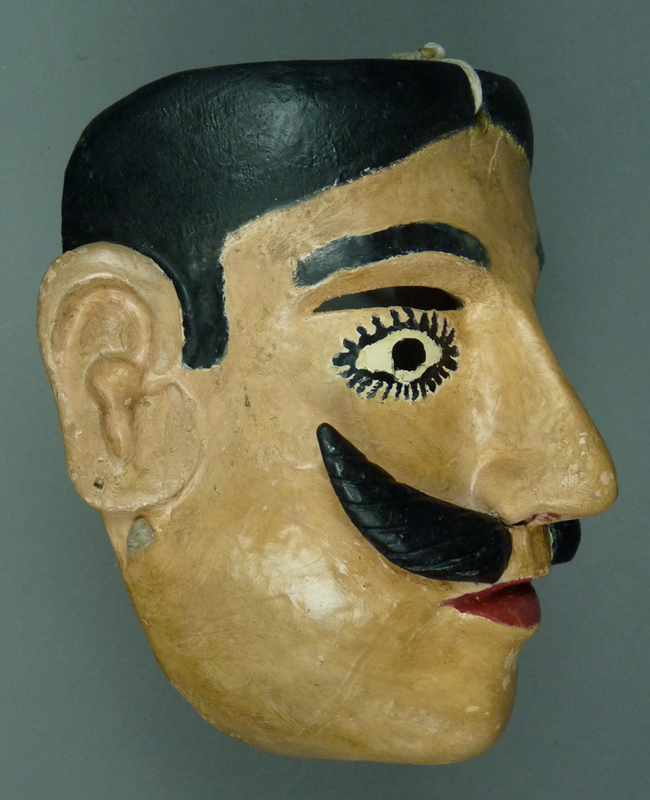 This mask was created in the Totonacapan, but it somehow ended up a hundred miles north, in the Huasteca, a region where the carvers do not ordinarily provide their masks with ears. Pickers and traders spread such objects around. Next I will add a second mask by the same carver, to demonstrate the consistency of this carver’s style. I purchased this mask from Alina Juárez Pérez, who is the daughter of Benito Juárez Figueroa, in 2008. 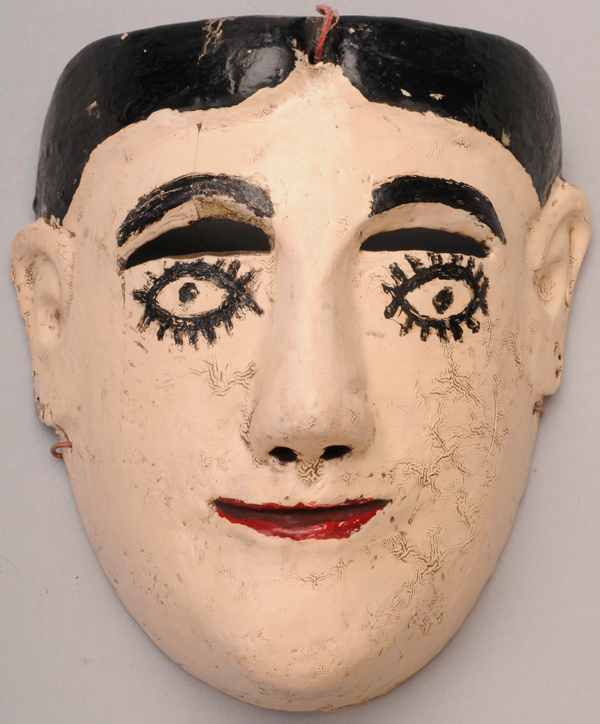 It introduces a new wrinkle, as this mask was carved to represent a female Tejonero, but the carver’s family later converted it to a male, apparently to please the carver’s grandson, by nailing on a wooden mustache. Such gender change operations are very common in the Totonacapan. One telltale sign is the hairline. In this region, female masks have a hairline that curls past the top of the ears, while male masks often have relief-carved sideburns that extend the hairline down to mid-ear. In this case the hairline was extended with paint alone, not by carving. In contrast, the relief-carved and grooved hair of the previous mask extended down the front of that mask’s ear. Also note that the ears of this mask were originally pierced for earrings, and the hole is still there on the right ear. Otherwise, you may have already noticed some obvious similarities with the last mask. The combination of brows and nose is very similar, as is the mouth. The eyes are painted, not carved in relief. The ears have the same design. From the side, one can see the ear very clearly, with its piercing. The delicate carving of the nose is much easier to see on this mask, compared to the last. The shape of the hairline at the ear remains difficult to see, although it is probably easier to see that the right sideburn is not carved in relief. The back of the second mask is rather darkly stained, all over. This mask does have the same carved hollow for the nose, and that area does demonstrate differential staining. 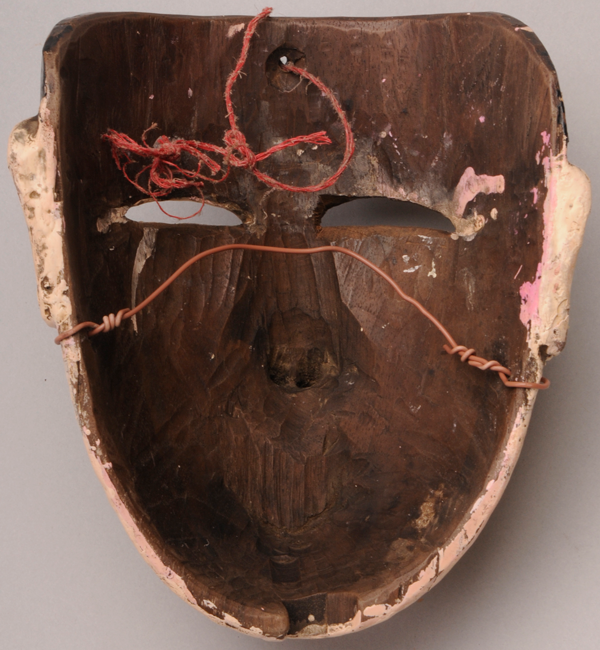 Likewise this mask also has that carved “shelf” below the nose that is typical for this carver. 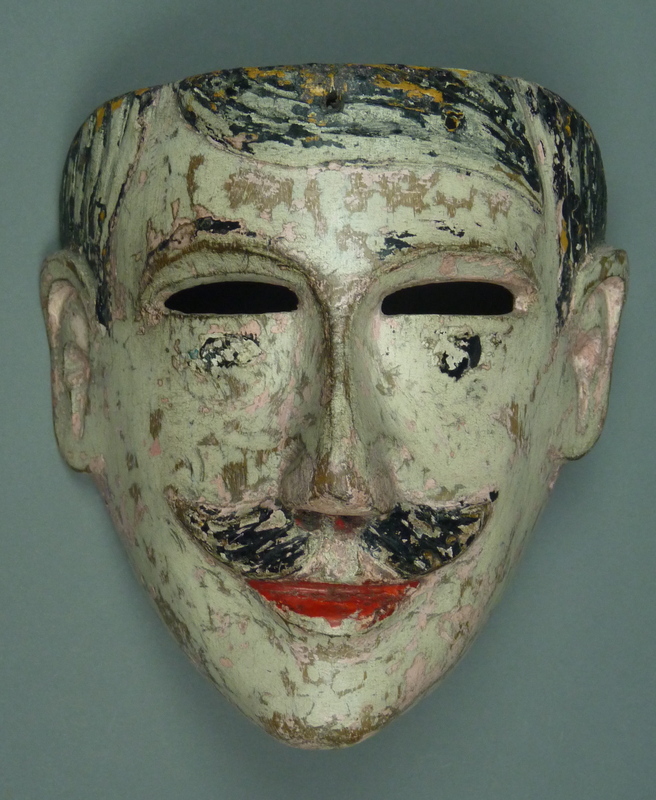 And here is a third mask in Benito’s early style. There is an amusing story about this mask. Vernon Kostohryz bought it from a dancer in a remote part of the state of Puebla. It was extremely dirty, so Vernon held it under the faucet in the bathroom sink at his hotel. To his shock, all of the dirt washed off at once, leaving him with this stark white mask with crinkled paint, which had suddenly lost the patina on its face. It did still have terrific patina on the back. In fact, if you compare the back of this mask to the second one in the last post, you will be hard pressed to see any difference between the two. At that time I had not yet discovered the female to male mask that came as the identified work of Benito, and this was just another anonymous mask, waiting to be identified. The relief carved hairline on this mask is clearly in the female pattern. We see again the integrated design of the brows and nose, along with painted eyes. The ears have the right shape, but the details are obscured by heavy repainting. Another view of the ear, still not very convincing on its own. The back of the pale faced female Tejonero mask has all of the features that one could desire to verify that this mask was carved by Benito. We see the hollowed area for the nose, the flattened shelf at the level of the mouth, and the forehead hole for the strap that is recessed. 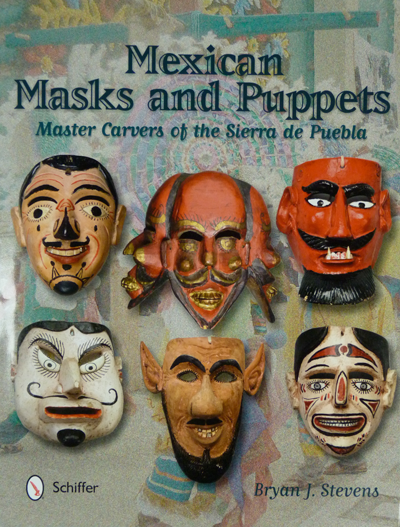 In conclusion, the general lesson of this post is that it is possible to study the style of an individual carver, permitting one to pick out excellent masks from the weird mixture that is currently offered for sale on the Internet. As you will continue to see in the masks to follow, one spots the work of an individual carver by the idiosyncratic details of his style. Next week I will say more about this carver, Benito Juárez Figueroa, including a demonstration of the ear design that he typically carved during his later years. Welcome to my website, and do let me know if there is a subject of particular interest to you. Throughly enjoyed your first post , Bryan. This blog will be a treasure trove for those truly interested…and who find it. I am posting the link on social media, and also will be encouraging other to share with their contacts. I will be setting up a system to send out new posts to those who request this service, and you are the first person to sign up. I’ve been surfing online greater than 3 hours nowadays, but I never discovered any attention-grabbing article like yours. It is lovely value sufficient for me. In my view, if all site owners and bloggers made good content material as you did, the net shall be much more useful than ever before. In my quest to identify a Mexican dance mask I recently acquired at an estate sale, I came upon your website with it’s many fine specimens. I have searched everywhere on the internet over the last 6 months and have not found a mask that is similar to this one in appearance. Since I can;t attach photo’s to this website contact form, I would love to email you some pictures directly if you would share your email address. I have to comment here. Im very, very impressed with you. I was able to follow ever word of your article effortlessly and understood with no questions your ” lesson”. What’s better, Bryan, you explain the subject in such an organized and concise manner that i, and this is rare, was able to retained ALL of your priceless info ( even the names!) and i only read that particular article once!! With much gratitude, i thank you and want you to know that u have saved this newbie mask collector the frustration of endless and fruitless internet searches. Not everyone can articulate their thoughts as you do. i guess having a vast knowledge is only part of teaching, effectively sharing is just as important. it is what makes your writings on this website a pleasure to read and share with others. Its always great to see a person with a gift , use that gift. Thank you. ha! you are probably thinking whats the big deal? well thats brcause organized thought must come naturally. You’re the Mona Lisa Vita of masks! absolutely. Thank you for your kind words. Actually such organization requires a lot of work, but one learns so much in the process. Can you give me a source who can identify a mask I bought at an estate sale? I can send the attachment or link. I live in Chicago. Send photos, front and back, and I will do my best to identify your mask. There is a menu item at the top of the website- Tell me about my mask, that will permit you to attach photos.